Playgrounds used to be a fairly standard thing; a slide, a swing, some things to climb and some things to run along. These days there are some pretty impressive playgrounds in suburbs all over Adelaide. 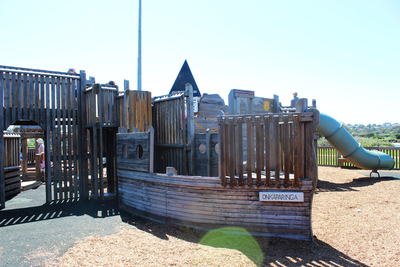 If you frequent a playground or two you probably have a favourite, so where is Adelaide's best playground? I still think St. Kilda Playground is one of the best. Followed very closely by Jubilee Park & Tusmore and Burnside Park. The last two are lovely spaces with well integrated playgrounds. St. Kilda Playground is really great, but we haven't been out there in years. Definitely Saint Kilda and its just been renovated! However I do recommend bug repellant especially for little ones and anyone prone to mozzie bites.